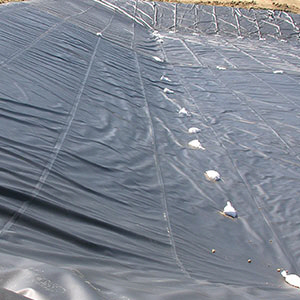 GeoSkrim™ GSBB consists of two sheets of high strength linear-low-density polyethylene laminated together with a third layer of molten polyethylene. A heavy-duty scrim reinforcement placed between these plies greatly enhances tear and puncture resistance and increases service life. GeoSkrim’s heavyduty diamond reinforcement grid is designed to quickly respond to tears by surrounding and stopping the tear upon impact to prevent further damage. The outer layers contain carbon black to stabilize and enhance outdoor longevity. Click here for Product Data Sheet.